Country: Japan | Beer Apprentice - Craft Beer News, Reviews, Interviews and Info. Hi guys. I hope all is well. Sorry about not posting yesterday. Got caught with a “honey-do” list. Well, I’m back at it today and for this review I’m going to be trying the Hitachino Nest White Ale produced by the Kiuchi Brewery located in Ibaraki-ken Naka-gun, Japan. I haven’t had the opportunity to try many beers from Japan and I have never tried one from Hitachino, however I’ve heard some real nice things, so I’m looking forward to this one. I had a problem with getting connected to the brewers website, so, like always, I checked on ratebeer.com for some info. This brew has an ABV of 5.0% and it comes in an 11.2 oz. bottle. This one poured a very cloudy, yellow to orange color with a bright white head. It was sized nicely, very fluffy, soapy and soft. The retention time was quite good and the lacing looked pretty good too. Not a bad aesthetic appeal with it at all. The nose brought out a very forthcoming scent of spice. Mostly coriander and ginger. It was about as much or more as any of this style that I’ve ever encountered. Some fruity orange citrus tried to combat the spice, but it had a hard time doing so. It also smelled of dried crackers and wafers. It almost smelled salty. Honestly, it kept me interested throughout the entire drink though. The taste was very similar. Tons of spice. Coriander, ginger and a touch of white peppercorns. Bountiful amounts of bread and cracker malt. Some of that orange citrus made an appearance again, but it was very light for the most part in my opinion. Again, more salty than sweet. The mouthfeel was medium bodied. Very dry, but crisp, refreshing and thirst quenching. A slight spice bite and warmth was felt with the initial swallow, but it quickly dissipated. The carbonation wasn’t as bold as I thought it might be, although it was still sturdy enough for a good showing. Only an average amount of flavor was left behind after each sip. Well, I think this is a nice beer for sure. It’s definitely worth a try. It doesn’t quite resemble a traditional White Ale due to the heavier than normal spice and relaxed fruit, but I could easily see the similarities. This one was just a little different (in a good way none-the-less). It’s easily the best Japanese beer that I’ve tried thus far and I would have no trouble at all trying it again. The drinkability was good even with the somewhat salty profile. 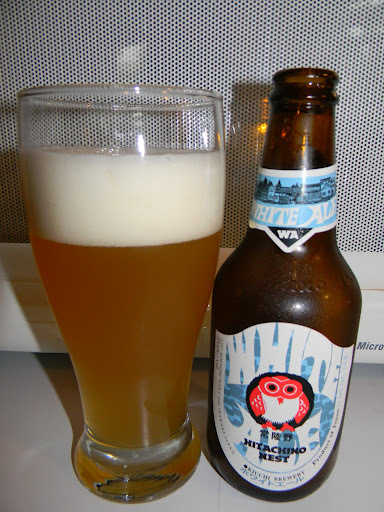 I would love to hear what you guys think if you have tried the Hitachino Nest White Ale. Be sure to leave a comment if you wish. Thanks for checking back for another review. I really appreciate it. For tonight’s review, I thought I would take a little trip to Tokyo-to Tokyo-shi, Japan and try the Kirin Ichiban Special Premium Reserve. The Kirin Brewery Company is a subsidiary of the Anheuser-Busch, Inc. I haven’t had the privilege of trying very many Japanese beers and I’m hoping that this one leaves a better impression on me than the previous samples I’ve had. From the website, kirin.com, I found a nice description. In 1990, Ichiban’s debut made a splash in the world of super premium beers. The luxurious single wort (or first press) process yields a unique, complex flavor. With his gold label and “Special Premium Reserve” appellation, Ichiban outclasses and outperforms. But don’t be fooled by a snooty attitude — this is a great beer that goes with anything. Well, let’s see how “great” it is. This beer poured from a 12 oz. bottle and had an ABV of 5.0%. The appearance was a very clear, straw/yellow color. The cap was very bright white, very fizzy with little to no retention or lacing. Tons of bubbles are rising to the top, which leads me to believe that this thing is way over carbonated even before I take the first sip. This beer totally reminds me of a “macro.” I guess it stands to reason since it is brewed, technically, by Anheuser-Busch. The smell was straight corn and grain adjuncts. Some minuscule malt in there. Biscuit maybe? Everything was so faint and non-existent that it was hard to pick out any distinguishing aromas. Man, I don’t even want to drink this. The mouthfeel was extremely light and watery. I will say that it was a bit crisp, but that is almost irrelevant. It doesn’t leave any taste on the palate whatsoever. It completely vanishes the moment you take a sip, which was a good thing because the taste was not very pleasant. Any lingering of flavor could be a complete turnoff. Way too carbonated for my liking. This brew might be fairly refreshing if I was in the middle of the Sahara desert with the temperature baking at about 115 degrees. Other than that, I probably wouldn’t want this under any other circumstance. I did finish it, which is always positive I guess, but I don’t think this is anything I will be picking up again. I have to admit that I do like the label on the bottle. This beer may have it’s place in some circles, but I would rather not be invited to that party. Has anyone else out there had this?